I know that TECHNICALLY I shouldn't have a Christmas theme up YET...but oh well! I love this time of year so very much and I have not stopped reminding Andrew that on Friday we will be purchasing our tree! I can't wait! If you couldn't tell, I'm kind of excited. p.s. 32 days till Christmas!! This past Saturday, I had the opportunity to watch the North Carolina Tar Heels decisively defeat the Miami Hurricanes. It was one of the most satisfying college football victory I have seen this entire season. One part that made it so satisfying is because my brother-in-law, Jon, is a BIG Miami fan. And don't get me wrong; I like Jon and any other time I would want the Hurricanes to win their match-up. But this weekend, I wanted them to go back to south Florida with a 'L'. It was the perfect day to experience football in Chapel Hill because the weather couldn't have been better and the stands were packed full of the most beautiful shade of blue. Through the course of the game Miami's quarterback threw four interceptions. That's right-FOUR. And two of those resulted in a Tar Heel touchdown. I had an amazing time with everyone and what made it even better was making the drive back to Charlotte knowing that Carolina had beaten a great Miami team. Because they are great. And as much trash as I had been talking to Jon, I honestly wasn't sure what the outcome would be. So needless to say, I was thankful for those interceptions and that Carolina's defense showed exactly what it's made of. Winning this game also makes Carolina bowl eligible. All in all, a much needed, wanted, and loved victory! One day I hopped in a taxi and we took off for the airport. We were driving in the right lane when suddenly a black car jumped out of a parking space right in front of us. My taxidriver slammed on his breaks, skidded, and missed the other car by just inches! The driverof the other car whipped his head around and started yelling at us. My taxi driver just smiled and waved at the guy. And I mean, he was really friendly. So I asked, 'Why did you just do that? This guy almost ruined your car and sent us to the hospital!' This is when my taxi driver taught me what I now call, 'The Law of the Garbage Truck.' He explained that many people are like garbage trucks. They run around full of garbage, full of frustration, full of anger, and full of disappointment. As their garbage piles up, they need a place to dump it and sometimes they'll dump it on you. Don't take it personally. Just smile, wave, wish them well, and move on. Don't take their garbage and spread it to other people at work, at home or on the streets. The bottom line is that successful people do not let garbage trucks take over their day. Life's too short to wake up in the morning with regrets, so..... 'Love the people who treat you right. Pray for the ones who don't.' Life is ten percent what you make it and ninety percent how you take it! For as long as I can remember, it's been the little things at Christmas that make it magical. Now that I've gotten a little older and can appreciate things such as Starbucks, it's DEFINITELY the Christmas cups that make me oh so very happy. And last night as I drove to the gym, I listened to a Christmas mix that I had created at least 2 years ago and it was delightful. This year has just gotten away from me, and therefore, it's even harder for me to believe that Christmas is right around the corner. With that said, I believe that listening to festive music is a must, even if it is a couple of weeks until Thanksgiving. I love this time of year...if you haven't noticed. I would love to hear about everyone is starting their Christmas spirit! The Carolina basketball season officially started last night. And after defeating a rather scrappy F.I.U (Florida International U.) team, the Tar Heels are 1-0. Have I mentioned that I love this time of year? I think I even like football a little more when basketball co-exists with it. 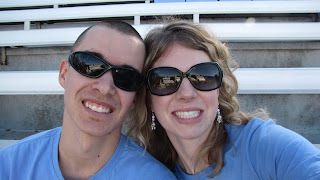 Andrew and I left Charlotte yesterday afternoon and arrived in Chapel Hill a little before 5. Since tip-off was set for 7:00 this allowed some free time to see Erin and Burke and enjoy their wonderful company for about a hour. After we sadly parted ways, Andrew and I drove back onto Carolina's campus in search of some parking, which is always a task when attending any college sporting event in the state of North Carolina. Once inside the Dean Dome, I could literally feel my excitement growing. There is nowhere else in the world like that building. And since this was the first game since winning the National Championship game, the atmosphere was electric (seriously). The game was better then I could have imagined. It seemed so strange not to see that #50 jersey on the court and I know that it will probably take a few games for that to really sink in that that's the reality of it. But there are some talented freshmen playing this year and once they get the chemistry figured out, they're going to be a tough team to beat. Seeing the next 5 months (not nearly long enough) unfold will be exciting and I only wish that I could be in those seats for each and every game. I am discovering more and more that I have a lot to learn. And along with that, I am learning the areas that I am severely lacking faith and that realization is tough. Currently, I am trying to figure out how Andrew and I can better budget our money. We're trying to financially smart and that is more often than not easier said than done. It seems to be every time we're catching up and being able to save a little bit more, something comes up. And that is actually helping to increase my faith in that particular area. God is constantly teaching me things that I'm not sure I wanted to learn in the first place, but praise Him. Each and everyday I'm learning to be a more faithful servant, a better steward of my resources and more trusting. He has blessed Andrew and myself with more then we could ever dream of or ask for. So why in the world can it be so hard after seeing all of these blessings to have a little more faith in money and job situations? The answer; the flesh. I let the world and the enemy get into my head. Again, I have to learn that trials and sufferings happens in order to bring glory to God's name. So although the pruning season can be a difficult one, I am ready to learn and in the end be more faithful. God is good no matter the season, situation or circumstance. How in the world can I question Him and His ways and what He is doing on my life? That answer; simple, I can't. I feel like I say this at the beginning of every new month, but I CANNOT believe that it's November. It just doesn't seem possible. But here it is, November 1st. And just in case that wasn't enough of a reminder that the end of 2009 is fast approaching, 91.9 (the Christian radio station here) started playing Christmas music this weekend. I love Christmas and everything about it, but let's at least get through half of this month before listening to "Let It Snow". Just my opinion. I am really excited for this coming week though for a couple of reasons; first is that I have a potentially BIG thing happening on Tuesday. I'm excited, but trying to stay calm and just wait on the Lord. Another thing is that Andrea and Aaron are coming over for dinner on Tuesday. I love those two so very much. They are an amazing couple and a joy to be around. I'm sure other things will come up as the week unfolds, but as for right now, those are my two things that that let me know that Monday will be bearable. This weekend was also nothing short of great. On Friday Andrew and I met at Chili's with some great friends to celebrate my birthday! It was so much fun to get together with these girls and their hubbies for some good food and great conversation. Then yesterday, I started out the day by enjoying coffee with Nina and finished it with Brooke and Justin and lots of pizza. Andrew and I got some good time together in between all of that. I will never be able to articulate how incredibly blessed I consider myself. God has given me some amazing friends and a strong Godly man to spend the rest of my life with. What more could I ask for? I hope all that read this had a great weekend and are equally as shocked with the arrival of November. Enjoy your week!